The Autostat IV is an intelligent, microprocessor driven humidity controller, which unlike conventional humidistats’ is based on a determination of absolute humidity, not relative humidity. 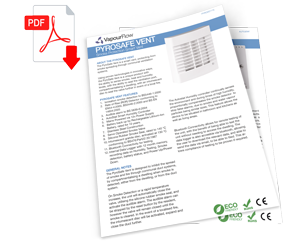 The important difference between the two is that absolute humidity is not affected by the temperature of the surrounding environment, making the Autostat perfectly suited to environments with widely fluctuating air moisture content such as kitchens, laundry rooms, shower & bathrooms whilst not being affected by the ambient background humidity. By way of example, cooking and tumble dryers produce copious amounts of water vapour, however a local RH% controller would register only a slight increase in RH% due to a simultaneous increase in temperature causing the air to hold more moisture (See graph below). Increased ventilation would therefore not be triggered. The Autostat would however identify a change in the moisture content of the air and react accordingly. The Autostat samples the surrounding environment at regular intervals, stores and averages the results over the previous two hours and uses this as a reference base of humidity for the next two hours. When the measured humidity exceeds this reference base by a predetermined amount the controller triggers action, as illustrated in the graph below. Another sample is taken after a few minutes, the difference between this and the initial trigger reading is used to calculate a total running time for the ventilation equipment to operate. This mechanism results in the ventilation not being influenced by ambient humidity, resulting in much more consistent in its operation. Autostat IV is pre programmed at the factory and should require no adjustment through its lifetime. The units operate on 240V AC and 12V AC/DC and provide output control through relay load output position 1.